Dan Jarvis, mayor of the Barnsley, Doncaster, Rotherham and Sheffield Combined Authority, has joined calls from business leaders and civil society leaders in the North to demand control over funding needed to rebalance the economy. The last allocation of funding lead to a legal battle with the Government. In March 2019, Britain will exit the European Union (EU) and the Government has confirmed that it will launch the UK Shared Prosperity Fund, using money returning from the EU to provide funding for economic development and local growth across the UK. In a cross-party call, the Mayors of Greater Manchester, Liverpool City Region, Tees Valley and Sheffield City Region (SCR), alongside the NP11 Board, representing the North's 11 local enterprise partnerships, the Northern Powerhouse Partnership, the voice of business in the North and the People's Powerhouse, a grassroots movement, say the Government must fully fund and devolve the money. EU Structural Funds have been committed until 2020 and are worth £2.4 billion a year - £1.2 billion from the EU, matched by public and private sources. A joint statement from the leaders said: "Ministers have promised a consultation on the Shared Prosperity Fund this year and this is becoming urgent if we are not to be left with a damaging gap between the ending of EU Structural Funds and the setting up of the Shared Prosperity Fund – a gap which would lead to the closure of vital economic programmes and investments." Over €200m in EU funding was expected to be used to support businesses, inward investment, infrastructure, innovation and social inclusion in the SCR until 2020. EU funding has been used to support growing businesses and enable job-creating infrastructure and commercial property projects to be realised. A number of SCR projects are currently being developed to utilise millions in EU funds before Brexit. The Government has previously said it will guarantee EU funding for structural and investment fund projects, including agri-environment schemes which continue after the UK has left the EU. Northern regions have previously fought the Government on this issue. Led by Rotherham Council, a legal fight with the Government failed over the way it decided how millions of EU funding was allocated. The coalition Government diverted funds to devolved areas such as Scotland and Wales which meant that €60m less than the European Commission notionally allocated for South Yorkshire was actually allocated to the SCR. 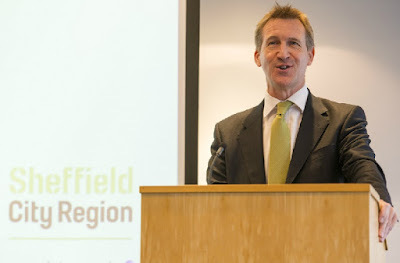 Dan Jarvis, mayor of the Barnsley, Doncaster, Rotherham and Sheffield Combined Authority, said: "As we get set to leave the European Union in March next year, it is critical that the Government reaffirm their commitment to devolution by giving elected Mayors control of a fair share of the money that used to be sent to Brussels."